I am active on Social Media and have devised a social media policy to clearly set out to my clients how I operate ethically and professionally on public sites. The policy is also to protect my client’s privacy and confidentiality, and our therapeutic relationship. If you have any questions about this policy then feel free to ask them in our session together or via email. 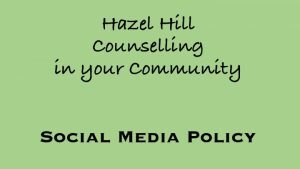 I have a Facebook Professional Page for my Sheffield counselling and online practice but I have no expectation that you will follow this. I use this page to share my blog, inspirational quotes and any helpful articles on mental health issues. You are welcome to follow this page or even ‘like’ the page but I will not engage in any counselling or help via this page. You can comment on this page but do bear in mind that this could compromise your confidentiality that you are seeing me as a client or it may impact our therapeutic relationship. I post articles, quotes, helpful tips and my blog posts at @ucangrow. You are welcome to follow this twitter feed or share any articles I tweet. I will not follow you back as I will only follow colleagues or mental health organisations. If you do share anything then remember retweeting can, just like Facebook, compromise your confidentially or our working alliance. I will not offer any personal help or support through twitter. I have a personal twitter account and I recommend you do not follow this. This is my professional profile. You are welcome to look at it but I will not accept any requests from clients or from anyone I do not know. I regularly blog about mental health issues giving useful self-help tips. I have no expectation that you will follow this or comment on it. Just like twitter and Facebook, remember commenting can compromise your confidentiality. If you choose to comment on it, I suggest you use a pseudonym name and a different email address in order to protect your privacy. Additionally, if you choose to follow this via email then your contact details will be stored on my computer. I will not search for clients via google or any other search engine. I will not also follow or comment on current or past client’s blog posting. Either of these activities could jeopardise our therapeutic relationship. If there are things that are online that you wish to share with me then you need to please bring them to your counselling session so that we can talk about it. Do not message me via Facebook, twitter or LinkedIn. I do not monitor these accounts actively and these accounts are not secure. If you wish to contact me in between our sessions then either telephone, text or email me. You may have found out about me on sites such as google+, counselling directory, Cornerstone, or other places that list businesses. Some of these sites allow users to add a review. If you have found me via these sites you are not obliged to rate or endorse me as a client and I will never ask you to leave a review. You do have the right to comment on these sites. Remember these sites are public forum and any sharing any information could reveal who you are. To protect your privacy it is best to use another email address and pseudonym name. If you do have any issues that are troubling you then it is best you bring it to our sessions together as this can be an important part of our therapy.